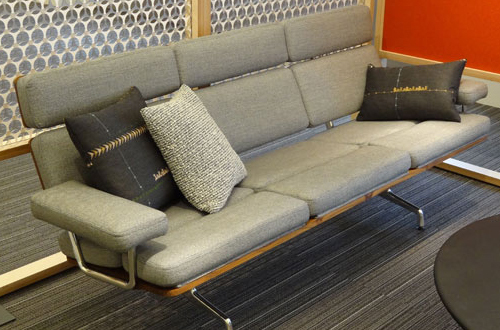 Place Textiles is part of the Textiles Alliance Program (TAP) at Herman Miller. 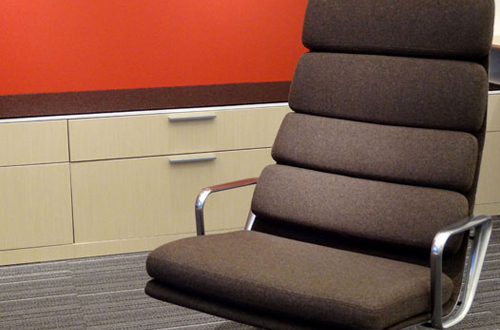 The fabrics described below are pre-approved and graded in for use on designated Herman Miller pieces. 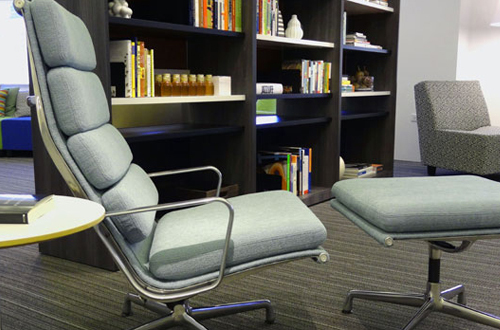 This alliance is a response on the part of both Herman Miller and Place to address the evolving needs of the market. For customers looking for a luxurious but durable alternative to the Herman Miller standard offering, Place provides a terrific option. 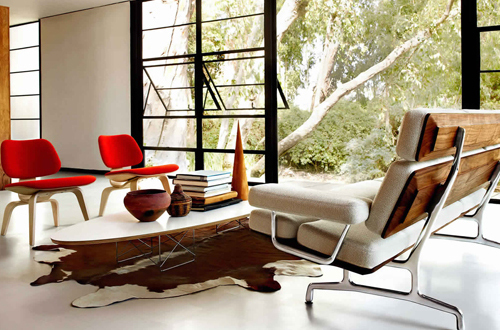 The Place color palette of sophisticated neutrals and rich, saturated hues is especially complimentary to the Herman Miller legacy of clean lines and bold color. 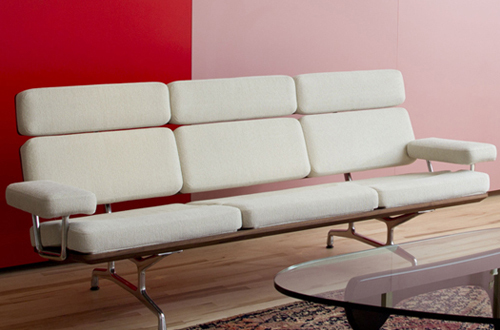 The Place attitude toward design integrity and quality in upholstery makes this alliance particularly ideal. Balmory is a luxurious yarn-dyed wool boucle of exceptional durability. This fabric has a natural resiliency and will conform to any contour. The fabric is perfect for modular pieces or anything requiring texture with a little stretch. Balmory does not require backing. This timeless houndstooth check of medium scale is woven from pure virgin wool. It is ideal for upholstery, drapery or wrapped surfaces. The luxurious hand, coupled with excellent durability, make this check a great choice for high use areas. This sturdy tapestry offers essence of haute couture in a nubby texture. The multicolored tweed is nuanced in texture and sophisticated. Excellent in upholstery situations where durability is a must, Berlin Tweed is a perfect choice for high-traffic areas and applications where real life meets with design. Genoa employs a finely spun boucle yarn to create a tightly woven surface with subtle luminosity and surprising strength. This fabric will tailor perfectly on any style of seating and is ideal for all types of applications, including wrapped headboards and walls. Hidden Canyon literally mirrors the vertical striations found on the canyon walls of the desert Southwest. A slightly luminous yarn is bound into a tight weave that creates a sleek but textured surface. 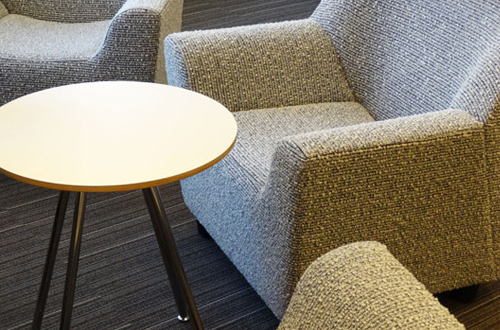 Available in eight subtle colors, Hidden Canyon is a Durable Luxury™ fabric and is perfect for seating applications of all types. One of the Place Durable Luxury™ fabrics, Laguna is soft to the touch and will provide a subtle texture to any interior. Ideal for those real life circumstances where food, children and pets are a daily factor, Laguna will provide both sophistication and service everywhere from children’s rooms to family rooms to breakfast nooks to the living room sofa. This lively micro pattern is woven in a nuanced combination that makes it the perfect chromatic link between materials of all kinds. The pebbly texture and matte finish create a welcome contrast to the luster and sleekness of other fabrics. Ideal for any situation where wear and tear are an issue, Marmara is another of the Place Durable Luxury™ fabrics. Exceptionally high abrasion results along with all the Durable Luxury™ performance characteristics make Marmara an excellent choice in both residential and hospitality applications including dining rooms, great rooms and party areas. 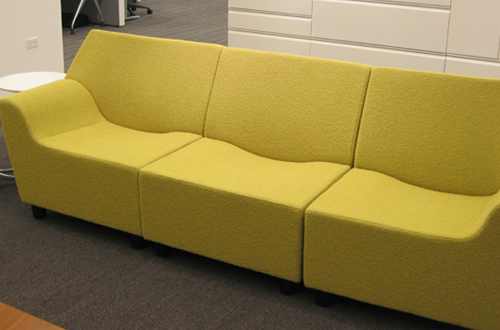 Meer has a smooth, reflective quality that will provide a sleek appearance to any upholstered form. Created by using lustrous yarns in closely linked color relationships, Meer shimmers around curves and will add vibrancy to any interior. Only available in natural white, Mt. Stuart is the closest thing to a fleece that is not on the back of a sheep. Woven from a lofty boucle yarn that runs in both the warp and fill direction, Mt. Stuart is identical on both sides. 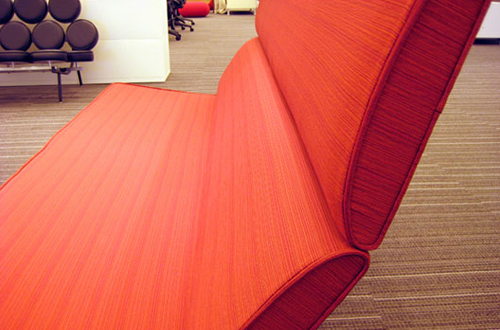 Designed to be used as an upholstery fabric, Mt. Stuart also makes perfect pillows and cozy throws. Oasis is an inviting texture woven on striaed warps which lend a subtle depth to the overall palette. The resulting nine shades perfectly reflect the desert landscape and provide appealing colors to be used in virtually any interior where the Durable Luxury™ attributes are important. Taking its inspiration from fine worsted suiting, Oban wears like iron and will tailor impeccably on any form. This highly versatile fabric can be used for upholstery, wrapped surfaces and drapery and will provide years of handsome good looks. Petaluma is a flowing large-scale pattern that appears to be embroidered on the surface of a finely woven ground. Available in a palette ranging from elegant to whimsical, Petaluma is perfect for adding a bit of drama to any interior. Ravenna is another of the Place Durable Luxury™ fabrics and is perfectly suited for those situations where real life collides with the best design intentions. Ravenna has a subtley striated pile that provides a wonderful texture. Like all the Durable Luxury™ fabrics, Ravenna is easy to care for and maintain. Seven Springs, a member of the Durable Luxury™ family, uses the same striaed warps as Oasis and introduces a multi-colored stripe into the collection. Matte yarns in closely related colors alternate across the surface of this lush texture and are held in place by a tightly spun yarn with soft luster. The result is a handsome stripe in the striking hues of the desert. Veneto Stripe owes its sleek and colorful complexity to carefully calibrated warps that provide perfect multicolored balance. Veneto Stripe is a true chameleon and will make friends with whatever it is used with. This highly durable fabric is not only versatile but has a timeless look that makes it a classic.